Having pure mania has it’s down side but the up side is you a lot of great work done and you are usually relatively creative. I take Adderall for my mania and I think that also contributes to my creativity. I started like 6 weeks ago partaking in this photography challenge WordPress puts out on Fridays. I am by no means a photographer of any sorts but my ideas are creative. It gets me a lot of likes in something I really don’t belong doing. Today’s challenge was called Edges. 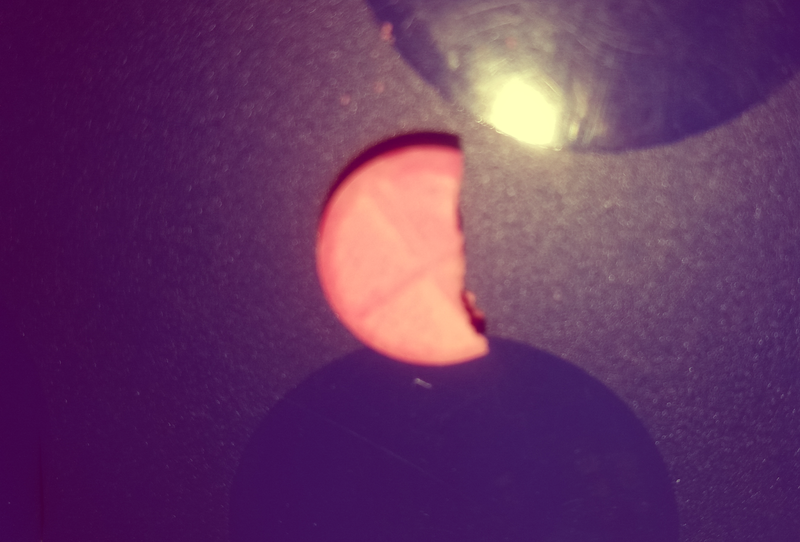 I took an Adderall pill and broke it and wrote “This is the jagged edge of my pill that helps quiet my mind so I can create.” I will post a picture of it with this post. It is grabbing some serious attention and I have been getting more likes on my WordPress blog today than I have in a while. Creatively it is a homerun of a day. Not so great in other ways, but creatively a homerun. I will take it as in Prep School I would have been voted the least creative person. I found all my creative energy after the age of 20. As I get ready to turn 40, I wonder if my creativit y is going to spike even higher. There is sure lots of room for improvement. I am just psyched today about writing about my blogs-getting really close to the 300th post on this blog and what it will look like going forward. This is an add-on post and I mainly posted to share the two pictures I took today: one of my jagged Adderall pill and one of my little black pug, Julia Bleu, on her couch waiting for me to scratch her belly. Sometimes I really appreciate Stephanie! So here’s today’s pictures and get yourself #AMPED for a #HECTIC weekend!